On arrival at Jabalpur, transfer to your hotel. Relax and refresh for some time and later proceed for Jabalpur city tour in which we will visit famous marble rocks valley Bhedaghat (25kms). Here you can do boating, visit Chausath Yogini temple and Dhuandhar waterfall. In addition to this we will visit Madan Mahal fort, Kachnar city temple, Rani Durgavati Museum.Overnight at hotel in Jabalpur. After breakfast, drive to Bandhavgarh. After some relaxation and having lunch proceed for afternoon jungle safari of Bandhavgarh forest. 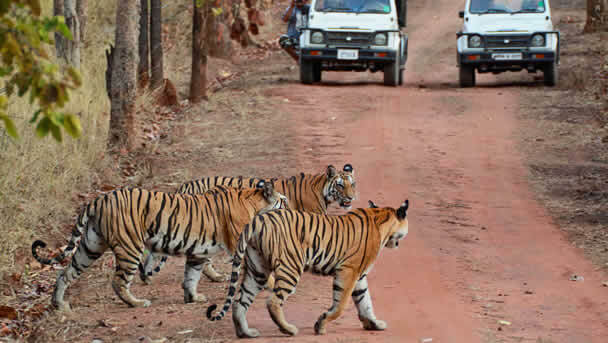 Jungle safari drive will be the best part of this tour package where you can experience the rare wild moments and find yourself in lap of nature. Overnight at resort in Bandhavgarh. Attend morning and evening safari drives. Here in Bandhavgarh you have better chance to spot tiger/s in the wilderness along with other commonly seen animals like Sambar, Spotted Deer, Sloth Bear, Wild Boar, Jackal etc. Attend morning & evening safari drives. In addition to mammal sighting, you can also enjoy bird watching in Bandhavgarh. Some of the commonly seen birds are Shikra, Kingfisher, Blue Jay, Serpent Eagle, Lapwings, Cattle Egret, Jungle Babbler, Herons, Vultures, Stork, Ibis, Honey Buzzard, Red Jungle-fowl etc. Overnight at resort in Bandhavgarh. On this day we will continue our wildlife expedition in Bandhavgarh forest. There are 03 forest zones in Bandhavgarh Tiger Reserve: Tala zone, Magadhi Zone, Khitauli zone. We will divide safari in between these zones to explore and cover as much as possible as some animals are centered in some specific areas of the forest like wild dogs, blue bull, leopard etc. On this day we will wind-up our tour. After breakfast, drive to Jabalpur city for departure. On reaching Jabalpur, have lunch and later drive to airport/railway station for departure.